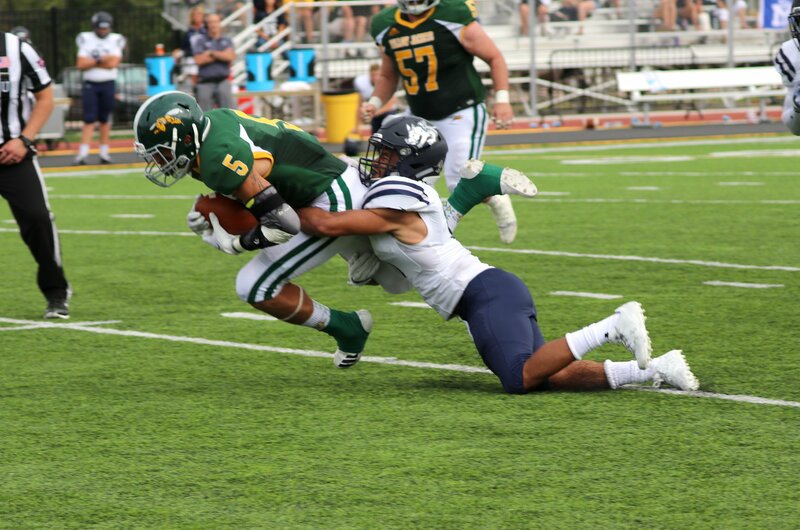 DURANGO, Colo. – The Black Hills State University football team recorded three interceptions, but had five turnovers of its own, and fell to Fort Lewis College, 34-14, on Saturday afternoon. Neither team's offense was able to move the ball in the first quarter, with the teams exchanging scoreless drives. The Skyhawks (1-3, 1-3 RMAC) were finally able to break through when they got an interception returned for a touchdown with 2:31 remaining in the first. On the Yellow Jackets (0-4, 0-4 RMAC) next drive, quarterback Collin Powers fumbled the ball, and with a short field, FLC was able to punch the ball in, taking a 13-0 lead with 11:26 remaining in the half. BHSU's first drive of the second quarter was unproductive, with the offense going three-and-out. On the ensuing Skyhawk drive, Fort Lewis scored again as Brayden Lucero rushed it in from 27-yards out, going up, 20-0. The two teams exchanged turnovers on their next possessions, as BHSU lost the ball on a fumble in the red zone, before Drew Hebel intercepted FLC quarterback Nick Hammons. The Yellow Jackets were able to take advantage of the turnover, as Tyler Hammons threw his first career touchdown, finding Eriq Swiftwater with 2:12 remaining in the half. The Green and Gold entered halftime down, 20-7. In the second half, the Yellow Jacket offense was unable to move the ball consistently, and although Drew Hebel recorded his second pick, the BHSU defense could not keep FLC out of the end zone two more times. With 1:17 left in the game, the Yellow Jackets drew a bit closer, as Swiftwater caught his second touchdown of the game, this time from Powers. Fort Lewis ultimately won, 34-13, earning their first win of the season. "The defense played a solid game today. They gave us the ball in good position," said head coach John Reiners. "But we have to take care of the football. We're going to go home and regroup, because there's fight in this team." Collin Powers threw for 177 yards and one touchdown, while Tyler Hammons threw for 77 yards and a touchdown in his first game action as a Yellow Jacket. Swiftwater caught 10 passes for 77 yards and two touchdowns. Defensively, Marquise Clayton led BHSU with 12 tackles. Bailey Rosenstrauch had an interception, while Hebel had two picks. For the Skyhawks, Nick McNamara threw for 124 yards and a touchdown. Parker Strahler caught a touchdown, while Lucero rushed for a score. Defensively, Nathan Aguilar and Suli Tukumoeatu each had a pick-six. The Green and Gold will next come home to host their Swarm Days game. The Yellow Jackets welcome Dixie State University on September 29 at 1 p.m.